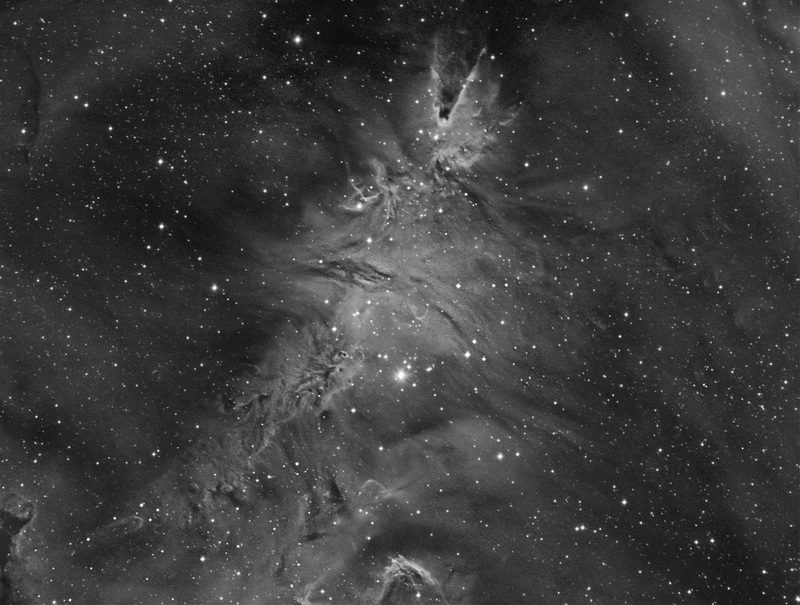 NGC 2264 is the designation for the Cone and Christmas Tree Cluster located in the constellation Monoceros approximately 2,600 light years distant. The cluster contains over 600 young stars with estimated ages between 1 and 4 million years. Several dozen type OB stars have been identified in the cluster. These are short lived massive blue stars that do not move far from their birth locations before exhausting their fuel and ending their lives. The very bright star located in the central area of the image is designated S. Monocerotis. It is probably the ionizing source illuminating the gas and dust in the surrounding nebula including the Cone Nebula located at the top of the image. This complex nebula structure and cluster forms the shape of a "Christmas tree" and gives NGC 2264 its name. The prominent clouds just to the left of S. Monocerotis is known at the Fox Fur Nebula. This entire area is an active star forming nursery. The nebulous portion of the Christmas tree structure is composed primarily of excited hydrogen gas and dust. A monochrome image taken through a hydrogen alpha filter may be viewed here. The image above is known as a mapped, or false, color image and was acquired using narrowband filters. It was assembled using the standard Hubble Palette with SII mapped to red, Ha mapped to green and OIII mapped to blue.